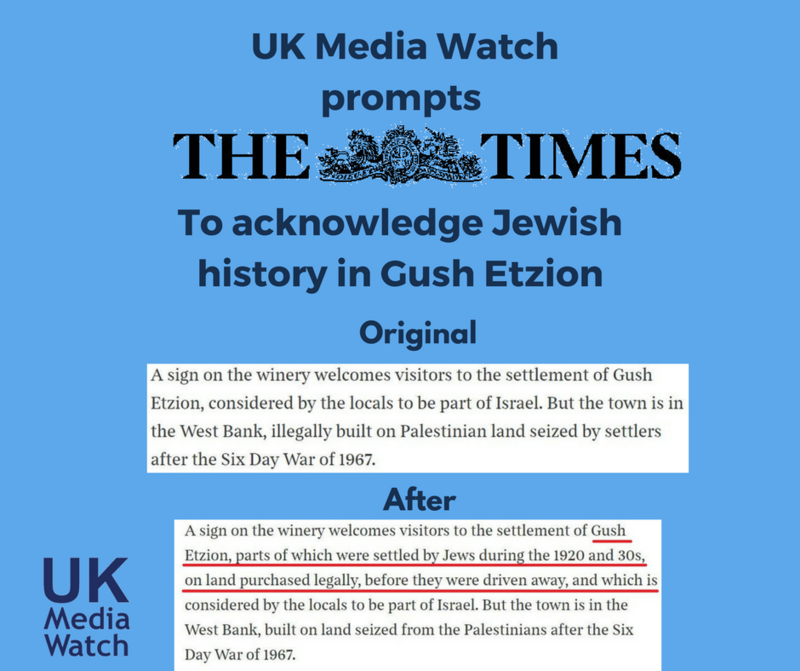 On June 11th, we tweeted Times of London and the journalist (Louise Callaghan) responsible for an article titled “Sun, gun and wine: tourists taste life of Israeli settlers”, regarding an extremely misleading claim about Jewish communities in Gush Etzion. As we explained in a subsequent complaint to Times editors, the Gush Etzion main communities were founded before 1948, in the 1920s and 1930s, on land legally purchased by Jews. Jews living at the original Kibbutzim were killed during the 1929 Arab riots, then re-established and destroyed again during Arab revolt of 1936-1939. Though Gush communities were re-established in the 1940s, they were again destroyed by Arabs fighters during the 1948 war. Though the winery itself is located on a post-67 community in the Gush Etzion bloc, the awkward and misleading text in the Times article made no mention of Gush Etzion’s unique history, and the legal and historic Jewish ties to the land. A sign on the winery welcomes visitors to the settlement of Gush Etzion, parts of which were settled by Jews during the 1920 and 30s, on land purchased legally, before they were driven away, and which is considered by the locals to be part of Israel. But the town is in the West Bank, built on land seized from the Palestinians after the Six Day War of 1967. Whilst this is clearly an improvement over the original, our colleague Hanan Amiur at Presspectiva has provided greater detail on the Jewish connection to Gush Etzion (text translated by Hadar Sela). “The land at [Gush Etzion] junction was legally purchased by Jews nearly 90 years ago. The Jewish settlement in Gush Etzion began in 1927, exactly at Gush Etzion Junction, in a settlement called ‘Migdal Eder’. At that time 924 dunams in the place where today the junction is located were purchased by Orthodox Jews from Mea Shearim, from the ‘Memory of David’ association.Two years later during the riots of 1929, the settlement was abandoned; set alight and destroyed by the Arabs. At the beginning of the thirties a private investor called Shmuel Holtzman bought the land from the ‘Memory of David’ association as well as thousands more dunams of the surrounding land and that brought about the development of Gush Etzion from the area of the junction itself to the surrounding areas on all sides. In the place where today stands the kiosk next door to the garden centre at the junction, Holtzman built a clinic in 1932 for his son Uriel who studied medicine in France so that he could provide medical care to the residents of the area; Jews and Arabs alike. In 1936, with the outbreak of the Great Arab Revolt, the settlement was abandoned again and seven years later, in 1943, the people of Kfar Etzion resettled the Jewish lands and rebuilt (for the second time out of three) Gush Etzion. Gush Etzion of course came under Jordanian occupation during the War of Independence. Nineteen years later, Israel retook control during the Six Day War. We commend Times of London editors on the correction. As anyone without an agenda knows, the lands in question were illegally occupied by Jordan by 1949 and seized (or liberated) from Jordan in 1967 – and at a time where the PLO had three years before formally renounced any rights to those lands in its 1964 Charter (Art. 24). Why is it that the cognoscenti and other bien-pensants in ivory towers pretend that the aim of Israel’s defensive war was to liberate a “people” from a country that had given them citizenship and from an “occupation” with which they had no issue? and ‘bien-pensants’ are right thinking persons, literally well-thinking. Are you praising and supporting the views of these people, or just displaying an ignorance of language demonstrated by using words you do not understand the meaning of? Thank you Charlie! I have just edited https://en.wikipedia.org/wiki/Palestinian_National_Covenant#History to add: The 1968 Charter also removed the 1964 Clause 24 which began, “This Organization does not exercise any territorial sovereignty over the West Bank in the Hashemite Kingdom of Jordan, on the Gaza Strip or in the Himmah Area.” That is to say, the Charter in its original 1964 form made no territorial claims over the West Bank or Gaza. The Wikipedia article, as it previously stood, made no mention whatever of that when it dealt with the changes between the 1964 and 1968 Charters. “the awkward and misleading text in the Times article” – or rather, hate-dripping propaganda. CAMERA’s unhedged commendation of the Times is unwarranted. As stated, it now reads the town is “built on land seized from the Palestinians ….”. Nonsense. It was seized from the Jordanians. and though it’s slightly off-point, few Arabs even identified as “Palestinians” in 1967, an identity conceived 3 years early but nor really mainstreamed unitl the mid to late seventies. Here is my correspondence with the Sunday Times. I find the “clarification” in today’s Sunday Times wholly inadequate & a “get out of jail clause”. I find t unacceptable & revealing that they chose not to publish my, or anyone else’s letter. Where is the Israeli Embassy in all this? What is it for? Thank you for your email. We have ensured that Louise Callaghan and the Foreign Editor are aware of your comments. We plan to publish a clarification on Sunday. In fact, the Etzion block of villages was built on land legally purchased by Jews in the early 1920s, but from November 1947 came under seige, cut off from Jerusalem. On May 13, 1948, the day before Israeli independence, its 127 villagers were massacred by the invading Arab Legion from Trans Jordan after they surrendered. Gush Etzion subsequently fell outside the 1948 Armistice cease fire lines, and the “settlement” was re established after 1967. The entire West Bank is under Jewish sovereignty in real international law, by the legally binding 1920 San Remo agreement and Mandate for Palestine document of 1922. It was endorsed by a 2013 legal ruling of the Versailles Court of Appeal, in a case brought against Israel by the Palestinian Authority. not recognised by any country including no Arab state, with the exception of Great Britain.